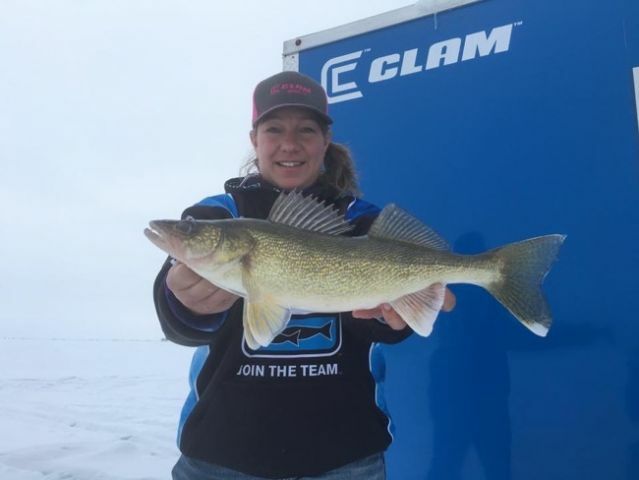 This week on her “Great Wild Radio Show,” Wild Barb talks to Shelly Holland, one of the first female Professional Ice Anglers. Shelly is in her 10th year with Clam as an Ice Team Pro. Shelly is a spirited character with a long history of jumping into adventures whenever she can. In addition to being a pioneer in the ice fishing industry, she also raced jet skis. Recently arning her captain’s license, Shelly hopes to someday be a charter captain for pleasure cruises near the Apostle Islands on Lake Superior. As if that isn’t enough, she also owns a food truck in the Minneapolis, St Paul area. Her customers wait for her bubbly personality to show up each day. In addition to seeking adventure, Shelly enjoys spending time with her Grandchild. Also, as part of the Women Ice Angler Project she will make several appearances across the Ice Belt. You can visit with Shelly at the St. Paul Ice Show the weekend of December 3rd. Just go to the Clam booth and look for the gal with the biggest smile. Wild Barb recorded this podcast with Shelly while in a boat on Lake Superior.